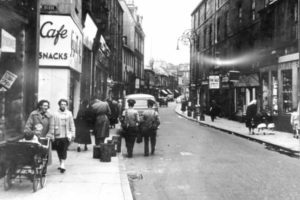 We have a treat for you with this screening – come and see some amazing footage of Leith, Edinburgh and across Scotland from as far back as the 1950s. We are also collaborating with Leith Creative for this one and will be screening ‘Persevere’ made by the Leith Film Project in 2008. Using rare archive footage and interviews, this documentary charts the decline of the working dock and the rise of the new waterfront developments, attempting to find out whether the spirit of Leith can persevere through these times of rapid change. We are delighted that we will be joined by director Derek Tillbrook to talk about the making of the film. Our Community Cafe will also be open from 2pm pm serving fresh coffee/tea, soft drinks and snacks.